This statistic shows the age structure in Brazil from 2007 to 2017. In 2017 about 21.75 percent of Brazil's total population were aged 0 to 14 years. Brazil is the fifth largest country in the world by area and population and the largest in both South America and the Latin American region. With a total population of more than 200 million inhabitants in 2013, Brazil also ranks fifth in terms of population numbers. Brazil is a founding member of the United Nations, the G20, CPLP, and a member of the BRIC countries. BRIC is an acronym for Brazil, Russia, India, and China, the four major emerging market countries. The largest cities in Brazil are São Paulo, Rio de Janeiro and Salvador. São Paulo alone reports over 11.1 million inhabitants. Due to a steady increase in the life expectancy in Brazil, the average age of the population has also rapidly increased. From 1950 until 2015, the average age of the population increased by an impressive 12 years; in 2015, the average age of the population in Brazil was reported to be around 31 years. 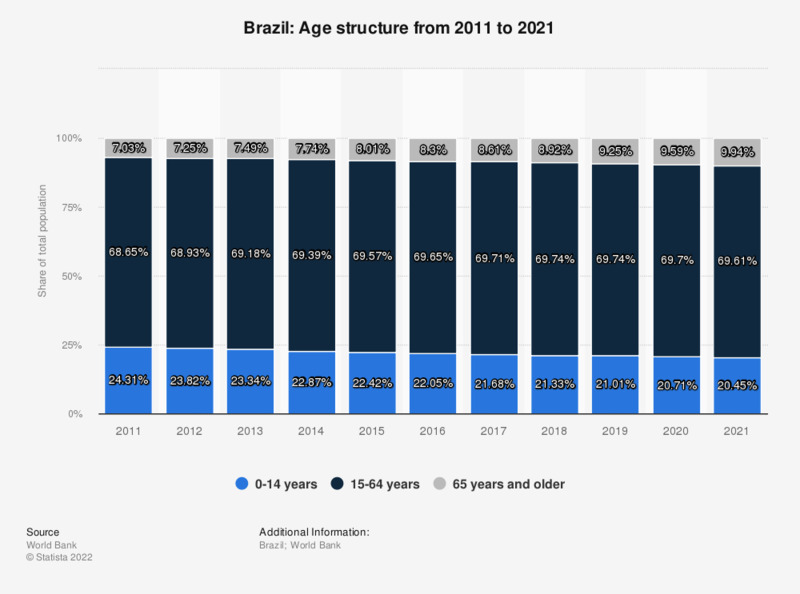 As a result of the increasing average age, the percentage of people aged between 15 and 64 years has also increased: In 2013, about 68.4 percent of the population in Brazil was aged between 15 and 64 years.